Simon Ramo (born Mary 13, 1913) is an American physicist, engineer, and business leader. He led development of microwave and missile technology and is sometimes known as the father of the Intercontinental ballistic missile (ICBM). 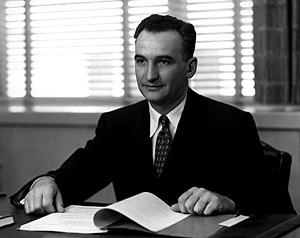 He has been partly responsible for the creation of two Fortune 500 companies of the 1970s; Ramo-Wooldridge (TRW after 1958) and Bunker-Ramo (now part of Honeywell). Ramo was born in Salt Lake City, Utah, the son of Lithuanian immigrants who ran a small store. He entered the University of Utah at the age of 16, and earned a B.S. in Electrical Engineering. By 1936, at the age of twenty-three) he had earned dual Ph.D. degrees from Caltech in Physics and Electrical Engineering. In 1946 he returned to California to become director of research for the electronics department of Hughes Aircraft, and his career became coupled with that of Dean Wooldridge. Together they formed an incredibly successful team for many years, with Wooldridge concentrating on investment and general business aspects while Ramo led research, development and engineering efforts. By 1948, Hughes had created its Aerospace Group to work with the also newly created U.S. Air Force. Dr. Ramo became a Vice-President and the Group’s Director of Operations. Ramo employed his skills in Systems Engineering to allow Hughes to deliver integrated RADAR and aircraft fire-control systems. He developed to air-to-air missile, creating the Falcon missile. By 1953, both Ramo and the Air Force had became increasingly frustrated with management problems at Hughes. Ramo and Wooldridge were particularly concerned when Howard Huges avoided their attempts to discuss the problem. In September they jointly resigned, and within a week they formed the Ramo-Wooldridge Corporation on September 16, 1953. In October 1953 an Assistant Secretary of Defense, Trevor Gardner, created a committee to consider the future of guided missiles. This Strategic Missile Evaluation Committee (SMEC) was headed by John von Neumann and included both Simon Ramo and Dean Wooldridge. In four months the committee produced their report and recommended that a crash program was needed to develop intercontinental ballistic missiles, and that such a program might enable us to overtake Russian developments by 1959-1960. Ramo-Wooldridge became the lead contractor for the resulting Air Force program. With Dr. Ramo as the driving scientific and engineering officer, they succeeded. In 1958 Atlas Rocket delivered a payload 5,000 miles downrange. The Atlas would go on to serve as the launch vehicle for NASA’s Project Mercury orbital flights starting with John Glenn in Friendship 7. USAF General Bernard Schreiver, head of the ICBM program, described Ramo as "The architect of the Thor, Atlas, and Titan" rockets. Ramo-Wooldridge merged with Thompson Products to become TRW, and Simon Ramo became Vice-Chairman. In 1969, when TRW spun off their Space Technology Laboratories division, it became Bunker-Ramo with Ramo as President and expanded into the computer and communications technology fields. In the course of a long and successful career Dr. Ramo has received numerous awards and fellowships. He has been honored by the American Philosophical Society, the Institute of Electrical and Electronics Engineers (IEEE), the American Physical Society, and the American Academy of Arts and Sciences. Ramo has also authored dozens of books on topics ranging from science textbooks, corporate and technology management, society’s relation to technology, economy, and how to play tennis. Dr. Ramo is retired and lives in Beverly Hills, California. Article by Dr. Edwin Reilly Jr.